One day you’re going to come to a fork in the road. And this new direction may look like the perfect route to take. But no matter how appealing it is, God may lead you to stay the course instead. Maybe you’re in college right now. You’ve been thinking, I’m not going to make it. It’s too expensive. It’s too much work. This is just too hard. A lot of people would just walk away. That may even be the right thing for you to do, as long as you’re sure that’s the way God’s leading you. But if God is speaking to you — if you’re hearing that still, small voice telling you, “You are not a quitter. You’re a finisher!” — then put your blinders on. Maybe something’s happened at your church that you aren’t happy about. Maybe someone did something really un-Christlike that challenged your faith. And now you’re thinking, Christians? Really? Whatever! They’re a bunch of hypocrites. Forget them! Someone once said that church would be great if it weren’t for the people. The problem is that the church is people, and people are imperfect. And imperfect people can make it hard to stay. Maybe what you’re dealing with is even more serious. Maybe you’ve been trying to come to terms with God. Something happened that you couldn’t understand, something you didn’t like. And ever since, you’ve been crying out to God, “Couldn’t You have stopped this? Why did You let this happen? If You’re going to allow things like this, I don’t need You.” Your story could be that you walked away from God, just like many people before you. Or your story might be that you decided to stay with God. You chose to accept that God will never leave you nor forsake you, so you stayed. After some time has passed, maybe you’ll be looking back, reflecting on your story, and you’ll realize that even though you didn’t know it at the time, God was using that very thing that you hated to rewire you, to change you, to transform your life. You perhaps didn’t think it was possible, but you’ve indeed changed in an important way. What the enemy intended for evil, God somehow used for good. Maybe your story will be that you learned to know God and His faithfulness in a way that you never had before. Maybe your story will be that you chose to live for Him and His glory in a way you never thought was possible. And all because you decided to stay with God. Maybe you’ve already been remaining faithful. Maybe you’ve been doing that for a long time. You’ve stayed in the same boring job, and you feel like a failure. You’ve stayed raising your kids, but you still feel like a failure. You’ve been stuck in the same boring marriage, and you feel like a twenty-year failure. 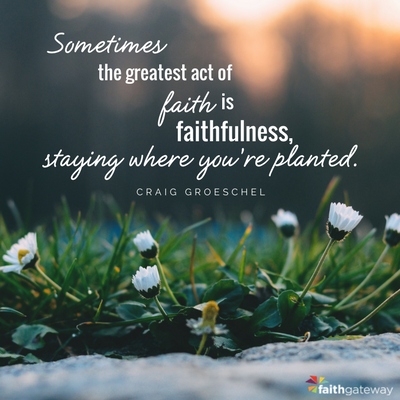 But sometimes the greatest act of faith is faithfulness, staying where you’re planted. One of my favorite stories about staying comes from one of my best friends, Bobby Gruenewald. Bobby started and sold two technology companies before he ever graduated from college. Obviously this guy is crazy smart. Bobby started volunteering for the church in his mid-twenties, and we eventually hired him. Although his contribution to the church was extraordinary, he didn’t feel like he was making a difference. So Bobby considered quitting and going back into business. Truthfully, it would have been easier for him. As a pastor, he still had a lot to learn. Business is second nature to him. But by the grace of God, he decided to stay. 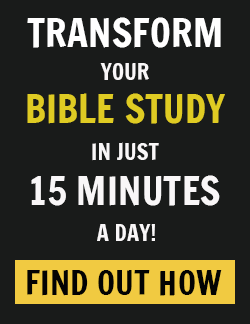 And among his many important contributions, Bobby came up with the YouVersion Bible App, an idea that has done more for Bible distribution than any idea since the printing press. So if you are tempted to walk away, make sure to seek God, because you never know what he might do if you have the courage to stay. Listen to what God is telling you He wants you to do. Sometimes the right decision is to stay. Excerpted with permission from Divine Direction by Craig Groeschel, copyright Craig Groeschel. 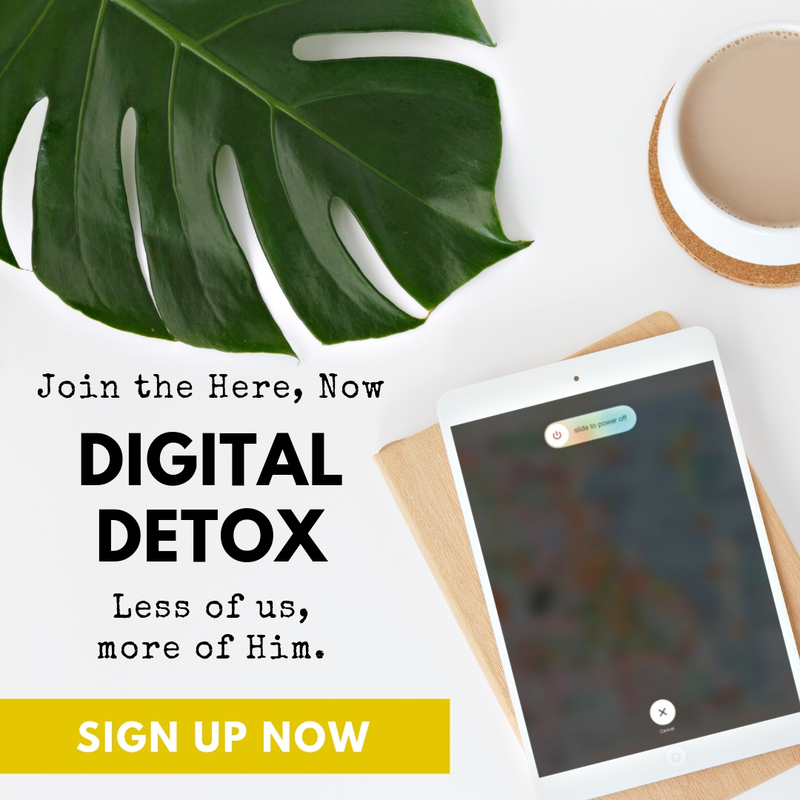 New York Times bestselling author Craig Groeschel is the founding and senior pastor of Life.Church, a pacesetting multicampus church and creators of the popular and free YouVersion Bible App. He is the author of several books, including #Struggles, Fight, Altar Ego, Soul Detox, Weird, From This Day Forward, The Christian Atheist and It. Craig, his wife, Amy, and their six children live in Edmond, Oklahoma.